Her willingness to face down Jean Claude Juncker and Michel Barner from the European Commission comes at time when the Government believes that the EU’s rigid stance on Brexit is softening and they are ready to compromise. But a new poll for BBC Radio 5 has revealed that the public are losing confidence in her negotiations with eight in 10 believing they have been handled badly by the Government. Speaking in an interview on BBC Panorama scheduled for tonight, she said that the “bloody difficult woman” is “still there”. She also admitted that she gets “irritated” by the debate over her leadership and lashed out at possible successor Boris Johnson. 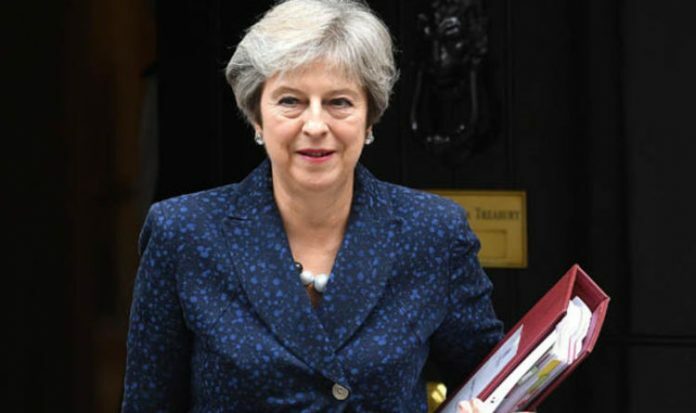 With Brexiteers criticising her Chequers plans which could leave Britain under EU control, she made it clear she is angered by speculation that they want to remove her as leader. Mrs May criticised Mr Johnson for using “completely inappropriate” language when he described her Brexit strategy as putting the UK in a “suicide vest”. Asked if she would reassure the Conservative party she was not determined to go on and on, the PM told BBC Panorama’s Inside No 10: Deal or No Deal? : “I get a little bit irritated but this debate is not about my future, this debate is about the future of the people of the UK and the future of the United Kingdom. Mr Johnson faced a Tory backlash after comparing Mrs May’s Brexit plan to a “suicide vest” and his former communications director, Guto Harri, said on Saturday that his ex-boss was “digging his political grave”. Mrs May said the former foreign secretary’s comments were “not right”. “I have to say that that choice of language is completely inappropriate,” she said. The former foreign secretary speaking at Heathrow Airport said: “That’s very much the right approach. “There’s a lot of support in Washington for that approach and a lot of people who really believe in our country. Describing his personal view on a hard Brexit he said: “I’m for doing the job, coming out of the single market so we can do good trade deals. He declined to comment on a leadership bid, but smiled and shook is head. Meanwhile, Mrs May’s Brexit plan was described as the “right one for now” and could be altered by a future prime minster by a senior cabinet minister. Environment Secretary Michael Gove, who helped lead Vote Leave in the referendum, admitted the Chequers proposals had forced him to compromise on some of his beliefs, but insisted the most important issue now was ensuring Britain leaves the European Union in “good order”. Asked if the plan would be permanent, Mr Gove told BBC One’s The Andrew Marr Show: “Yes, but there’s one critical thing, a future prime minister could always choose to alter the relationship between Britain and the European Union. Mr Gove said the responsibility was now on the European Union to compromise “because we’ve shown flexibility”. “I’ve been quite clear that some of the things that I argued for in the referendum passionately, as a result of Chequers I have to qualify one or two of my views. “I have to acknowledge the parliamentary arithmetic.